When we were still bright-eyed, bushy-tailed high schoolers, Tor and some friends made a list of things you could learn from history. I seem to recall "Don't invade Russia" was top of the list, but "don't drive in an open top car if you have enemies" was one of them. I have since been thinking that this particular entry should be amended to "Don't drive in an open top car or invite Poirot to spend time with you if you have enemies". Of course, that does not protect you from other people inviting him and you at the same time or neighbours inviting him to stay, in which case (I am sorry to say), the end is inevitable. Probably best not to get enemies. I have previously pointed out that while in Norway crime is the purview of Easter, English-speakers seem to be all in favour of a murderous (when not ghostly) Christmas. And there is one author it would be a crime to neglect. 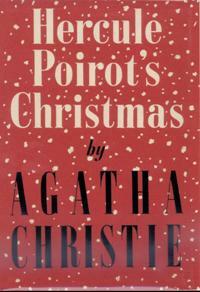 Agatha Christie wrote 66 detective novels and 14 collections of short stories, and it should be no surprise that there is not just one set at Christmas. I could think of two off the top of my head, and after consulting Jamie Bernthal, I was told that there is also a Miss Marple story called "A Christmas Tragedy" (I had actually read that, but not filed it under Christmas at all) as well as some religious children's stories (presumably sans murder). A pater familias with a sadistic streak and a past is foolish enough to invite his extended family for Christmas; and to make matters worse, he flashes uncut diamonds about and makes a lot of noise about planning to make a new will. Clearly the man has a death wish. Then he remembered his purpose and his lips set back in a grim line. No, by hell, he'd go on with it! He'd planned this for years. He'd always meant to do -- what he was going to do. Yes, he'd get on with it! She made a graphic gesture. Which is of course precisely how Mr Simeon Lee is murdered, upstairs, apparently while alone in a locked library while all the guests are elsewhere. And Pilar and Stephen are not the only suspects of course. All the guests are there more or less unwillingly, all have motive; and as is the custom with a locked room mystery, none seem to have had the opportunity. This is mainly so because the murderer had made such a lot of noise, causing people to arrive quickly at the scene. It was then he first heard the noise from overhead: a crashing of china, the overthrowing of furniture, a series of cracks and bumps. And then, clear and high, came a scream -- a horrible high wailing scream that died away in a choke of gurgle. Because of course Poirot is lodging nearby (see? ); in fact, he is just explaining to his companion why it is silly to think of Christmas as an unlikely season for crime, listing all the possible features of the holiday which may trigger other emotions than good will among men. Unsurprisingly, he is right. A gentle self-parody, wrapped around a properly bloody murder inside a Christmas story. There you have it. Should be pefect over the holidays. Ok, denne skal jeg lese. Har du den?